Quilting services are available to fit every need and budget. From basic quilting design to heirloom quilting, Garden Gate Quilting provides a beautiful finished product in a timely manner. Your backing fabric needs to be 10″ larger than your quilt top. (example – if you quilt top is 80″ x 60″, your backing needs to be 90″ x 70″. Batting should be at least 5″ larger on all four sides. If your backing is seamed, please use a 1/2″ seam allowance and remove all selvage from your backing fabric. Press the seam open. Do not use safety pins or baste your quilt in any way. Please mark the top left corner of your quilt top and backing with a safety pin. Please be sure that the backing fabric is square. A charge of $20 will be added if the backing fabric requires squaring up. A variety of patterns are available to suit your taste. Please feel free to choose a pattern that you like, or consult with Lisa if you are unsure what pattern fits your quilt. Custom quilting is also available. Lisa will be happy to discuss design options with you to make your quilting dreams come true! You’ve spent a long time creating your quilt top. Whether your quilt is a gift for a loved one, a show-piece, or just to put on your own bed, quality quilting increases the beauty and value of your quilt. 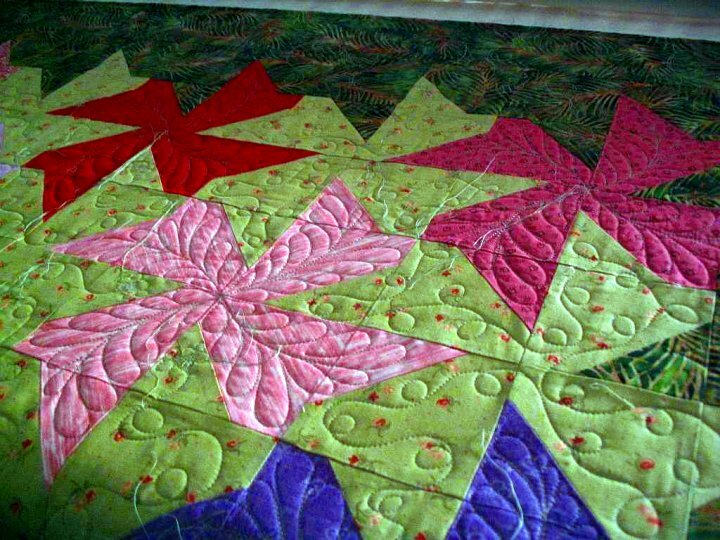 Don’t hold back–turn your quilt into an heirloom with Garden Gate Quilting. Other lofts and wool batting available on request. Garden Gate Quilting accepts payment by cash or checks payable to Garden Gate Quilting. Payment by Paypal or Venmo can also be arranged if requested. Ready to get started? Get in touch with Lisa to start the process. Be sure to include all the information you can, and Garden Gate Quilting will work with you to achieve your vision.